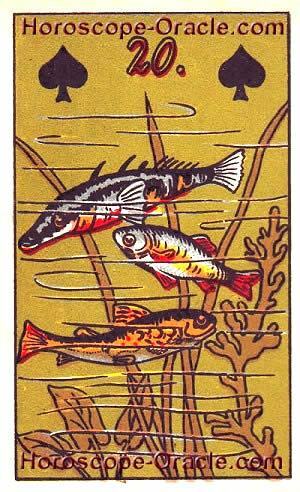 The result we combined with the right Lenormand Tarot card, the fishes. Today you will have a good hand in financial affairs. What you will touch will turn to gold. You will generate good profits. Today is also a good day for you to play lottery. Maybe a big win is waiting for you? A wealthy time is coming to you. You will start some new businesses and you will have success with it. The chance is big that you will make a lot of money. If you are employed, then soon a promotion will come. Instinctively, you know whom you want to give your feelings. After a short flirt, deep love will come, which nobody can describe. It will become very emotionally and deep. There is a big chance, that this love will last for a long, long time! In fortune telling the fishes are standing for money which will flow to you. It also stands for big luck in all financial affairs. The Fish symbolizes freedom but also drifting away.